ONI Bureau: A two day-long colourful celebration of Odisha’s culture, tradition, heritage & cuisine commenced at Surat International Exhibition and Convention Centre (SIECC), Sarsana, Surat today. Odisha Parba is organised by Odia Samaj, New Delhi. Denizens from every nook and corner of Gujarat and nearby towns will witness the unique culture, heritage, tradition, cuisine and various other delights from beautiful coastal state like Odisha till 3rd September 2018 at this Odisha Parba. 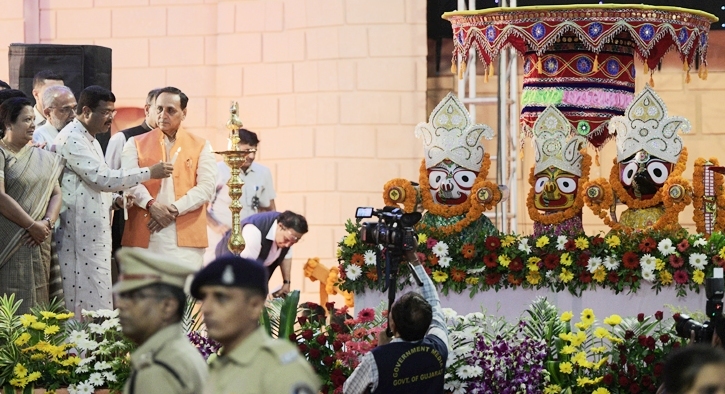 Chief Minister of Gujarat Vijay Rupani inaugurated the magnificent celebration of Odisha Parba in august presence of Union Minister of Petroleum and Natural Gas, Dharmendra Pradhan as Guest of Honour at the mega event. Among others Shri Ishwar Parmar, State Minister, Ganpat Vasava, State Minister, Shri Jagdish Patel, Mayor, Shri Nitin Bhai Bhajiawala, Shri Satish Sharma, Commissioner of Police, Shri Dhaval Patel, Collector, Shri Sidhartha Pradhan President Odia Samaj were graced the occasion. CM Vijay Rupani congratulated all odia people on behalf of all Gujarat people for organising such a mega Parba, ‘Odisha Parba’ at Surat. Odisha Parba is the amalgamation of both the culture and tradition of Odisha and Gujarat, said Chief Minister. Dharmendra Pradhan said Surat has become beautiful because of the hard work of Odia people here. Odisha Parba is the festival of emotions of Odisha and Gujarat. Narrating the objective behind this event, Sidhartha Pradhan, President, Odia Samaj said that, “I feel delighted to see the enthusiasm among the people of Gujarat who have come here to celebrate this magnificent festival Odisha Parba. Through this festival we want to show the people of Gujarat the rich culture and heritage of Odisha. People can now see glimpses of our culture through each and every product including handlooms like Sambalpuri Saree, Kotpad saree, handicrafts like applique, shell craft, pattachitra, coir craft and mouth-watering dishes like Gupchup katki Chaat, Pitha etc. Have a look at all our stalls and enjoy this 2 day event”.